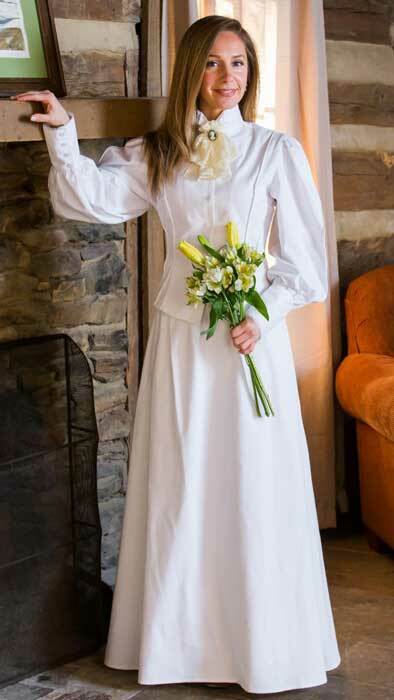 This Lovely Victorian Style 2 Piece Ensemble Features A Matching White Blouse And Walking Skirt That Is Great for that Special Wedding. The Blouse Has A Stand Up Wing-tip Collar, Large Gathered Puff Sleeves With A Pleat Down The Sleeve And They Are Also Gathered At The Large Four Button Cuffs. The Walking Skirt Has A 4-Button Closure For Ease Of Fit. Approximately 41 inches Long for Size Small and 43 Inches Long for Size 2X. Cotton Twill. With Lace Jabot (Style 30-C-103white) Sold Separately.